The North Shore of Sydney extends north of the harbour from North Sydney up to Hornsby. The location for games changes with the seasons based on council availability. 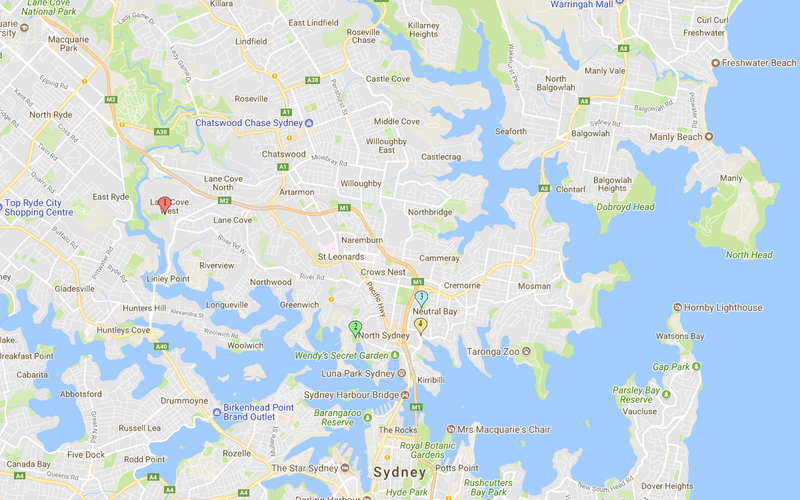 Blackman Park, Lloyd Rees Drive, Lane Cove West NSW 2066 (Red Marker 1). Blackman Park is on the eastern side of the Lane Cove River just behind the Lane Cove Industrial area, a short distance from the Lane Cove shopping precinct. It is surrounded by Woodland and is in a quiet location. The field has recently been upgraded to a full synthetic grass surface with 200 Lux lighting. This is truly an awesome facility. There is plenty of parking as well as toilet facilities. Click Here for a Map & Directions to Blackman Park. Waverton Park, Woolcott St. Waverton NSW 2060 (Green Marker 2). Waverton Park is situated just 1km to the South West of North Sydney. It is easily accessible from the Pacific Highway to the North via Bay Rd or Miller St to the east via Union St. The field has recently undergone a major upgrade, with fantastic new lights and playing surface. There is on street parking as well as toilet facilities. Click Here for a Map & Directions to Waverton Park. Forsyth Park, Montpelier St. Neutral Bay NSW 2089 (Blue Marker 3). Forsyth Park is situated to the east of the Cahill Expressway, best accessed from Military Rd Neutral Bay to the north or Alfred St / Pacific Highway North Sydney to the south. There are great lights on 1 field. There is on street parking as well as toilet / change facilities. Click Here for a Map & Directions to the Forsyth Park. Anderson Park, Cnr Clark Rd & Kurraba Rd, Neutral Bay NSW 2089 (Beige Marker 4). Anderson Park is situated to the east of the Cahill Expressway, best accessed from the south off Alfred St North / High St onto Clark Rd. There are lights on 1 field. There is on street parking as well as a new amenities building. Click Here for a Map & Directions to the Anderson Park.